On the first weekend of the New Year, I braved the bitter cold and headed out to a local writer’s workshop. The theme – perfect for starting the year – was “Writing Goals and Skills,” led by the president of the Detroit Working Writers. I purposely left my laptop at home, for a multitude of reasons. First, there was the practicality of lugging it in the cold. As uncoordinated as I can be, I envisioned slipping and falling in the icy parking lot, struggling to save my device as opposed to struggling to save myself. Another reason was so that I could focus on the subject matter, and take notes on paper with a pen. Before I even signed up for the workshop, I decided that the time was now to stop relying on typed lists and electronic devices, and start practicing my handwriting. My current chicken scratch certainly doesn’t reflect the nice handwriting I used to have, courtesy of the years of calligraphy I practiced many decades ago. Our workshop leader welcomed us, and had us review our calendars from last year to see how we did with our goals for that year. Well, the only calendar I had was in my phone. I hadn’t written anything down, and had to rely on what was posted on my device in order to jog my memory of what I had or hadn’t achieved. For years, I have failed to plan, relying on lists in my head, versus something concrete and in writing. The biggest derailment I found was that in addition to not writing my goals, hopes and dreams, when life threw curve balls – as it always does – I was easily distracted and didn’t get back to what I wanted to do. There was no accountability. When we reached the portion of the workshop to write down our goals for this year, it took me a few moments to decide what to write. And then I decided to write down anything and everything that popped into my head. What was the worst that could happen? Page after page, ideas flowed. There are so many things I want to do, and I felt remiss that I hadn’t done an exercise like this in ages. One of my travel journals. This one has my keepsakes from England. Of course, I listed career-related goals. But there were other pressing goals, too, such as a regular Bible reading routine, talking to family and friends in real life, not just via social media. I added travel plans, and workshops and the creative arts. I listed going to the library and to read more books – real books – not digital versions. There were items that pushed me out of my comfort zone, like leading writing workshops and being more social – which is sometimes difficult as a writer, because we need our quiet space in order to work. Purchased in Amalfi, this gorgeous journal is filled with the Italian Coast’s famous, luxurious paper. 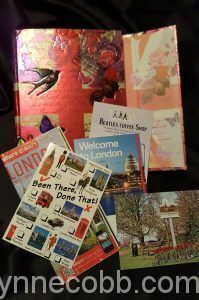 I felt like floodgates were opened, and honestly, I was a bit sad that it had taken me so long to write a wish list of goals. There were about 20 of us sitting around the conference table, assessing our lives and anticipating the new year of opportunities. Some of us were married; some not. Some had children; some did not. Some of us were grandparents; some were not. Some of us owned pets; some did not. Some were published writers; some were not. The differences in each of us were obvious. However, the common ground we all had? Ironically, all similar. When answering how we could achieve our goals, we were pretty united on cutting down on television and social media time. We were almost unanimous in wanting to read from real books and magazines, and plan trips to the library. We discussed ways to keep focused on our goals, using calendars, journals, creating story boards and more. One participant discussed the “Bullet Journal,” so upon returning home, I researched this and can proudly say, “I’m in.” I bought an inexpensive notebook and some nice pens. The new, dotted-line notebook will be for daily tasks, and the beautiful journals, purchased by my husband, will be used for journaling, quotes, doodling and calligraphy. In my research, I found that many people were returning to pens, paper, journaling and reading real books. A beautiful gift from my husband when he was in the Middle East. I have started my morning with reading my Bible instead of Facebook. I wrote a blog post – that you are currently reading! I started organizing my office to be conducive to writing goals. I called three friends this week instead of texting. Who would have thought that a two-hour investment would have been so life-changing? In just one week of journaling and setting goals, I am already seeing a positive difference. 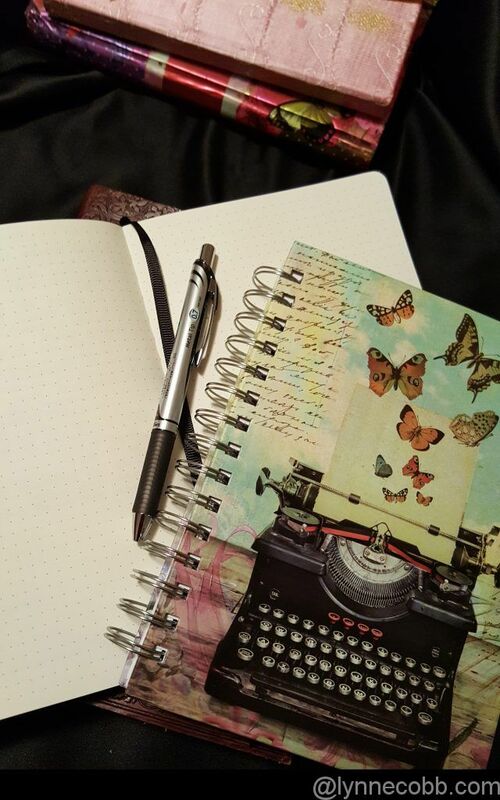 Have you started – or are continuing – daily journal writing? What are some of your goals for the new year? Please share in the comment section! If you like this blog post, feel free to share using the social buttons. Sign-up for emails with posts delivered directly to your inbox! Wow, Lynne. Wow, Wow, Wow. I really wish I had attended this workshop, but a medical issue is keeping me busy right now. I truly enjoyed your post. It really hit home. I am going to begin to journal this week. I will also begin “writing” my goals and experiences with pen and paper. I feel it is much more meaningful that way. I want to thank you, again, for writing this post. This may be the beginning of a new and better way of living my life! 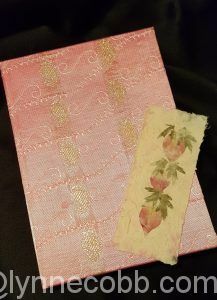 I have started an Art Journal Challenge for 2018, creating a new page each week with a different prompt. This week was Bullet Journal! Keep posting with your updates, I find it really interesting. I like that idea, Kim! I’ll definitely post updates. Would love to see your art journal. Thanks for sharing, Lynne. I am a BuJo fan too! I started last year, and I’m tweaking it a bit this year. Like you, I went totally digital until about three years ago when I craved the physical act of writing. I think research also shows that writing with a pen and paper helps connect it to our brains. I need all the help I can get 😉 I’ll be excited to hear how your goal-setting work continues! I’m with you, Beth! Totally need all the help I can get! I’ve already noticed an improvement in my penmanship. Now to get that hand/eye/brain connection 🙂 I’ll keep everyone posted on the BuJp and journaling. What an enriching and worthy workshop, Lynne. Thank you for sharing your experience and takeaways! I checked out your Bullet Journal link as well and am very interested in that. I can see how it would be so very helpful for organization. And now for my full disclosure – my handwriting is atrocious and I now find it odd to hold a pen. How sad is that? 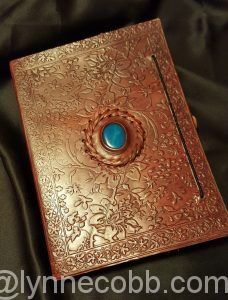 I do journal when I travel and last summer I picked up a beautiful leather book for my journalling. Thank you for inspiring me to write in it and to work on my own handwriting. I look forward to seeing your progress! Next PostNext Where were the parents?